In this scenario study, we sketch the most important challenges for the Netherlands to remain an attractive place for business with high-quality production and a flexible labour market. The scenarios offer students, employees, companies and government guidance in preparing for the future. By definition, the future is uncertain and becomes more uncertain the further we look ahead. The scenarios for 2040 sketch four possible worlds based on two fundamental uncertainties: the size of cities and the division of labour in the workforce. Sketching future worlds contains a strong element of storytelling, which is essential when investigating the future. Our stories are developed using anticipatory thinking where the aim is to develop a rich and detailed portrait of a plausible future world, including the challenges and opportunities that such an environment would present. Scenarios provide a useful tool in a world that is uncertain and unpredictable. They reveal different possible futures that are plausible and challenging. For a shorter horizon, quantifying the future might be feasible and meaningful. For a period of thirty years, we believe that quantifying the future becomes less important whereas developing scenarios about possible future images of the world gains weight. Forecasting future income growth is gradually replaced by presenting consistent and plausible pictures for future worlds. Our work sketches the most important trends, the uncertainties around these trends, and stories about the functioning and non-functioning of the economy in the coming decades. We point to the trade-offs policymakers face when trying to solve problems arising from market failures. We show how policymakers today may prepare for developments in the future. How will we earn our money in 2040? Policymakers are confronted with such questions. Decisions have to be made today based on current knowledge and cannot be made conditional on future events. For policies that can be changed rapidly, it is feasible to take action immediately and adjust the policy when it turns out to be the wrong one or when more knowledge about outcomes becomes available. It becomes another matter when policies have a long lead-time or when they involve investments with potentially large sunk costs. In such circumstances, policymakers have to trade off the benefits of waiting against the costs of delay. For instance, young people across Europe are paying the price for policymakers misjudging the trade-offs involved in labour market developments. To provide an answer to the question of how we will make a living in 2040, scenarios help policymakers to consider and reconsider different options. Scenarios bundle historical developments, current stylised facts and trends into consistent stories for alternative futures. We have developed four scenarios to analyse how the Dutch economy may evolve. In building the scenarios, we split the question of how we will make a living into the questions of who earns the money and where the money is earned in 2040. People are considered in their role as workers while cities are viewed according to the type of production that occurs there and the connections that exist within and between them. How do firms divide tasks among workers, and what will be the main characteristics of the workforce in 2040? What determines the size and structure of cities in 2040? The answer to both questions depends on the development of technology – the fundamental driver of future economic development. Information communication technology (ICT) changes the division of tasks among workers through two main channels: communication and information. The communication technology (CT) part of ICT facilitates transmission of ideas and information and enables people to quickly check and confirm their validity. Tasks that used to be highly integrated can now be disconnected and executed by different persons in different places. Workers specialise. The information technology (IT) part of ICT improves the way workers process information. Many routine tasks have been taken over by computers and expert systems. Systems that link up with each other process larger and more complex types of information. This broadens the scope of work processes. Workers generalise and become a jack-of-all-trades. Will a new general purpose technology arrive over the next 30 years? How that question is answered implies certain shifts in city sizes in the scenarios. In its early phases, the development of a general purpose technology strongly depends on face-to-face contacts. Researchers, innovators, designers and managers all benefit from close personal interaction in order to exchange knowledge. This initiates a shift towards larger cities. On the other hand, if there is no new general purpose technology, ICT will lead to scattering of economic activity across space. This will create smaller and well-connected cities. Since the future arrival of a new general purpose technology represents a major uncertainty, cities may either shrink or expand over the coming 30 years. The horizontal axis in Figure 1 presents the options for the division of tasks; the vertical axis shows the possibilities for city size. The scenarios are labelled such that the first term reflects the characterisation of people and the second informs about the type of location. For example, the scenario in which workers specialise and city size is relatively small is labelled Talent Towns. In this scenario, the economy is moving towards a task economy in which workers perform one or many tasks rather than producing one or only a few products. This implies a new division of work. There are two possible directions. First, workers specialise and excel in one or a few tasks. 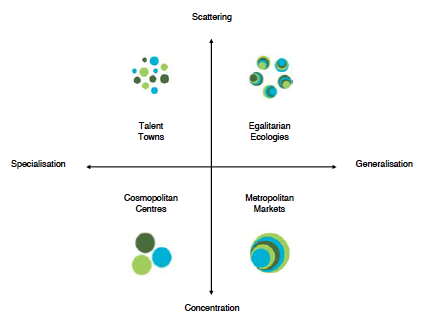 The cost of coordinating tasks determines how specialised firms and cities become. Examples of specialised cities are Detroit, which has specialised in producing cars. Second, workers are a jack-of-all-trades and mainly produce for the local market. The generalist worker is employed easily in many occupations. He uses inputs from the world’s knowledge stock and imports intermediate goods. Once again, the generalisation of work extends to firms and cities. Examples of generalised cities are New York, London and Amsterdam. The uncertainty about cities is not about cities becoming more important since this is true in all scenarios. The question is one of size: will they be large or small. The first possibility is that cities become relatively small and are scattered across space. They serve as small economic and urban spikes. In this world, there are few reasons for economic activity to cluster. A second option has economic activity becoming highly concentrated in a limited number of large cities. Cities are the meeting places of people for the purpose of trade, the exchange of ideas, and the development of new technologies, but also to optimise the match between workers and firms and between producers and consumers. Table 1 presents the most salient characteristics of each of the four scenarios. The table shows the implications of the scenarios for the size of the city, representing limited agglomeration benefits in Talent Towns and huge benefits in Metropolitan Markets. The scenarios are not only relevant to the Netherlands but also to the rest of the world. The scenarios offer guidance for long-term strategic policymaking. Technology determines the allocation of future production, which limits the scope for the government to intervene. The scenarios reveal that uncertainties in future production mainly involve uncertainty about the division of labour and about its distribution across space. This sheds light on today’s choices. For instance, investments in infrastructure should not only solve today’s traffic jams but should also take some account of possible future growth (or decline) of cities and the connections within and between cities. Public institutions for education, science and innovation have to look beyond today’s questions and consider the possibility that specialisation may become crucial. Finally, labour market institutions, although designed in the past, should anticipate future problems as well. Strengthen cities and infrastructure. Large cities should be able to grow, with a local network of public transportation and roads, combined with excellent knowledge institutions. Small cities require excellent connections in the form of highways and ICT networks. Education in worlds with specialised knowledge asks for early selection and excellence. Generic knowledge puts more emphasis on accessibility and broad basic training. Targeted innovation policies are only effective in the scenario with specialised and large cities. The role of the welfare state is limited in all scenarios. Opportunities are especially scarce in scenarios with much specialisation and much need for collective protection of vulnerable employees. The least protection is required in scenarios with an emphasis on generic knowledge in which the government at the same time is most capable of providing such protection. Renting a home is preferable to buying one in scenarios that emphasise specialisation. Workers renting a home are able to respond more flexibly and prevent a large drop in wealth when their specialisation becomes obsolete because of economic circumstances, as happened in the past in the textile industry in Tilburg and Enschede. Buying a home better suits scenarios with a broadly educated workforce. Specialised workers benefit from policies that stimulate retraining. The projected demographic change and the resulting necessity of a longer working life represent considerable challenges for (1) the individual quality of life and work of employees, (2) the innovative capacity and productivity of companies and (3) the negotiability of the welfare state. As its goal, the foresight project set out to analyse the concrete situation and development potential of the working world in the Province of Salzburg and depict the options for taking action at the micro-level (individual), meso-level (organisations) and macro-level (socio-political actors) in the form of scenarios. The project placed particular emphasis on transferring research results into practice. As in all of Europe, Salzburg Province also conforms to the population development trend that has been evident now for decades: a rising number of older people in retirement in contrast to a consistently sinking number of younger people of employment age. Because of this, a longer term of employment is required in order to secure the social systems and to maintain economic strength. Simultaneously, the employment-related difficulties are increasing for those in the workforce, for instance, through more rapid and increasingly complex work processes, time pressure or the devaluation of professional qualifications over time. In addition, a lack of professional specialists is expected, which is heightened further by the demographic development. In order to meet the challenges arising from the change in population structures and the workforce, it is important to become proactive and take determined measures in a timely fashion. In research and politics, the need for action is recognised in principle; however, there are deficits in implementing large-scale and in-depth problem-solving options in practice. Therefore, the project begins with sensitising and supporting actors in implementing age management in the working world. … presuppose that companies have a certain resource potential. These concepts are therefore not suitable to the general conditions of the smaller companies characteristic of Salzburg Province. In addition, many actors appear to be overwhelmed by the complexity of the problem and the numerous recommendations of how to tackle it. They often react to this by postponing necessary measures or even refusing to take action. Against this background, a two-part project structure emerged. First of all, it was important to grasp the specific situation in Salzburg Province in a basic research phase and to analyse the developmental stages to be expected in each of the topic areas and fields of action at the different societal levels (individuals, organisations, socio-political actors) that are significant for the further development of the regional labour market. Parallel to this, the project sought to identify the factors so far preventing employment appropriate for an ageing workforce. A further emphasis of this research phase was how age management concepts should be conceived for small companies to be able to apply them. On the other hand, the focus was placed on attempts to put the research findings into practice in an implementation-oriented transfer phase. Particular attention was paid to the enterprise and branch structure of Salzburg Province. The transfer phase involved an awareness-raising process regarding age management in the working world. The target groups here were both the companies as well as their employees – from the apprentice on up to the senior employee. The aim of the project “Future Strategies for Ageing Management in the Working World of Salzburg Province” is to set impulses for a working world in which companies facilitate the work capabilities of employees and societal structures are created to enable longer employment with a high quality of work life for everyone. In the process, it is important to take the diverse fields of action into consideration that together form a working world appropriate to ageing (Fig. 1). The target variables in the basic research phase were (1) the individual quality of life and work of employees, (2) the innovative capability and productivity of the companies and (3) the negotiability of the welfare state. With an eye to these main target variables, we analysed the challenges resulting from the ageing of the population for individuals, companies and socio-political actors and determined the measures to be taken to establish a living and working environment appropriate to ageing and the barriers in the way of implementing urgently needed measures. The complexity of the problems was described from multiple perspectives using the scenario technique in which the potential consequences of successful or, in some cases, unsuccessful age management was systematically varied on several levels. In an initial step, we reviewed the findings in the relevant research literature and of previous projects. In a second step, we conducted interviews with regional and supra-regional experts who were able to give a first overview of the relevant factors regarding developments in the working world. Expanding on the analysis of research to date and the explorative interviews with the experts, a total of four extensive structural analysis workshops (MICMAC) were organised for the central fields of action (education, health, business operations and society). These structural analyses were conducted by involving regional actors who were noted for their positions of authority and professional competence in each particular field of action. Based on the workshop results, influential factors decisive for the working world of Salzburg Province were identified and their reciprocal effects were described in a consistency analysis. Systematic variations allowed projecting numerous potential paths of development in the Salzburg working world. The three most plausible and significant development tracks were then compactly designed as scenarios. In this way, the first project track led to differentiated scenarios that illustrate the complexity of the topic while allowing to integrate the individual research results. Thus, the scenarios primarily enabled formulating the comprehensive and complex connections resulting from the demographic changes for the company context and beyond. They were meant to create awareness for the problem and were used as the basis for a second, practice-oriented project track, involving a maximum diversity of actors across all sectors. This second step was aimed at devising ways of giving higher priority to the necessary long-term structural and behavioural changes over short-term planning horizons. The scenario process revealed that the degree of activity on the political and operational level is significant for establishing age management in the working world. Political and operational activity thus form two axes along which the scenarios vary, leading to three conceivable scenarios. The fourth scenario in this scheme based on active political and reactive operational activity was excluded as implausible. In the first scenario, neither political nor company actors are actively involved in age management in the working world. Everyone struggles on his or her own and is driven by the demands prevailing in the modern working world. The second scenario depends on high initiative within the company itself. With persistence and readiness to make investments, a few succeed in mastering the challenges of a changing working world. The political initiative is missing that is necessary to push the less innovative and strong enterprises towards appropriate management of ageing. In this scenario, the political and organisational actors take collaborative action and establish suitable working structures. Step by step, they create a working world appropriate to ageing. The second line of the project centred on putting the research results into practice. Three scopes of application with different priorities were realised in order to make use of the lessons learned from the scenarios in the working world. The first module was to develop a model for age management in small and medium-sized businesses. Considering the particular situation especially of small-sized businesses, we developed instruments for assessing the current situation and sensitising actors to the problem of demographic change and devised measures to address the challenges. In a scenario workshop, employees were able to expand on what they expected regarding their own future career. A second module aimed at sensitising young workers. The apprentices were given opportunities to become familiar with the topic of “Labour and Age” in a creative way. They received information about the demographic change and its consequences for the working world and were instructed in a theatre workshop about preparing for the future challenges to be faced. The third and most important use of the scenarios was to sensitize socio-political actors. The scenarios provided a means of demonstrating to politicians, social partners and public institutions the underlying factors and connections and allowed to derive recommendations for action to establish age management in the working world. The practical experience modules were carried out in close collaboration with the Salzburg Occupational Health Services Centre for healthful employment, which plans to implement the project results in its future work with companies and their employees. Successfully surmounting the challenges of demographic change requires that the actors in Salzburg Province coordinate their efforts. A particular responsibility falls to the political actors who are in charge of the general structural conditions providing the framework for the job market in Salzburg Province. Due to the complexity of the topic and the economic structure of the region with its many small businesses, it is hardly realistic to expect any comprehensive initiative on the organisational level, or as the case may be, independent initiative on the individual level. Decisive factors for the formation of age management in the working world in Salzburg Province are closely linked with the amount of political action, on the one hand, and with the amount of involvement at the company level, on the other. 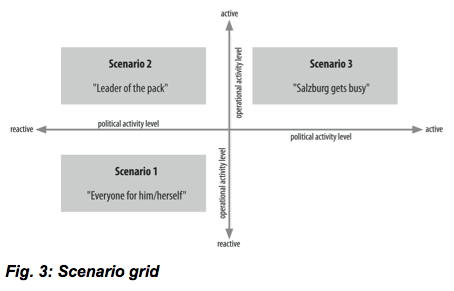 Individual behaviour in the working world in Salzburg Province can be viewed as a consequence of action at higher levels of social organization and cannot be expected to act as a major force in initiating change. The workforce must adapt to a longer working life. The political goal is to prolong working life and delay retirement. Early retirement based on exceptional circumstances and in cases of hardship is now more difficult. What measures are taken at the level of legislation and implementation will be decisive as to whether the extension of working life will be cushioned by welfare state regulations in socially responsible ways or whether the additional burden must be carried by each and every individual alone. The prerequisite for a longer working life is maintaining the ability to work. This poses a problem particularly in professions defined by hard physical labour and mental stress. Here it is rarely possible to remain healthy and motivated until legal retirement age. Thus, the primary goal must be to retain the individual ability to work. This pertains most of all to physical and mental health but also to skills and motivation. It is worth considering that a shortage of qualified workers in the wake of demographic change could lead to competition for the “best and brightest”, a situation already found today to some extent within some companies. Companies as well as the Salzburg Province itself are well-advised to shape the economic and other framework conditions so that the region remains an attractive economic location. Not every group in the job market can be expected to live up to the demands of life-long learning. For this reason, we can assume that there will be stronger polarity in the job market between a group of well to very well qualified workers and a group of rather poorly qualified ones. The better qualified will be highly sought after in the future and will perform challenging tasks whereas the rather poorly qualified workers will be left with the simpler and fairly stressful activities. The situation of the less qualified will worsen in the future due to the fact that certain qualifications will probably be required even for simple jobs. The demands in regard to knowledge, skills and proficiency will tend to rise even for positions requiring lower qualifications. Initiatives will thus be required in order to profitably integrate this part of the workforce in the working world throughout their entire working life. More strongly integrating women and retaining the ageing population in the job market would contribute to better utilising the potential workforce and better distributing stress in the working world. A very effective measure to that effect is improving structures for childcare. Less concrete but no less effective than welfare state and company regulations are the ideas entertained throughout society about the working world. The images of the working world in the minds of the general population have a considerable influence on behaviour in the labour market, for instance, concerning job preferences and choice of profession. Deficit-oriented perceptions of ageing, stereotypical gender roles or assumptions about the stages in an employment biography strongly affect individual working behaviour. Changes in the “labour market culture” in the service of age management in the working world could be one of the most powerful influences of all. 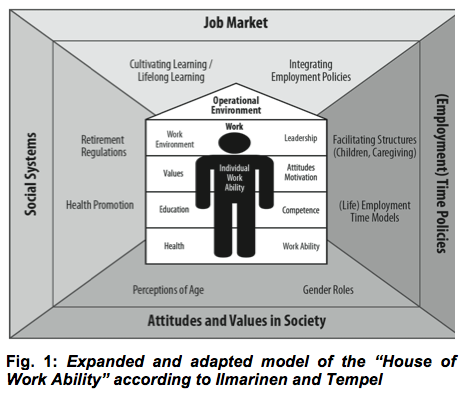 Ilmarinen, Juhani; Tempel, Jürgen (2002): Arbeitsfähigkeit 2010 – Was können wir tun, damit Sie gesund bleiben? VSA Verlag, Hamburg. Steinbach, Dirk; Linnenschmidt, Katja; Schüll, Elmar (2011): Zukunftsstrategien für eine alternsgerechte Arbeitswelt – Trends, Szenarien und Empfehlungen. LIT-Verlag. Vienna. The exercise had the goal of identifying market and industry trends and drivers for the automotive sector over a 20 year time horizon. In addition, performance measures and targets for the road transport system were defined. The technologies needed to meet these targets and the research required to deliver them were discussed. This foresight exercise was carried out in the context of a £100M programme whose current phase started in 2001 with a revision in 2003.